Playing with an iPad, one of the first things you notice is its speed. Everything zips into place. Our side by side tests comparing it with the iPhone proved that (for the most part) its snappiness isn't just imagined. Updated. The most telling test was loading Plants vs. Zombies. To keep things consistent, we ran the test with the iPhone version of the game on both devices. The loading bar flew across on the iPad, finishing just as the 3GS's loading bar was getting started. But direct comparisons on less intensive apps yielded more even results. For things like Pandora and Epicurious, the iPad had the edge, but for opening anything that comes preloaded—Notes, Calendar, Contacts, etc—the iPad and iPhone 3GS were neck and neck. The iPhone also kept up, somewhat surprisingly, while loading pages in Safari. The image-heavy Wikimedia Commons Hubble page took just about as long to load on each device. Granted, seeing that page snap into existence and take up the entirety of iPad's 9" screen is more impressive than seeing it do the same on the 3.5" iPhone, but strictly speaking load times were roughly the same. Maps, however, shined on the iPad. It rescales beautifully with pinch to zoom and hardly ever falls behind no matter how fast you flick. The bigger screen also allows for wider pinches and thus deeper zooms, which the iPad handles without a hitch. While apps are a toss-up—the bigger and more complex they are, the more they show off the iPad's speed—the iPad also shines in the most basic OS navigation. On the iPhone, hitting the home button is quick, but on the iPad it's instant. The difference might be imperceptible unless you hit the home button on each device, side by side, but it definitely contributes to the overall feeling that the iPad's just plain fast. What remains to be seen is whether or not the iPad will slow down over time, as iPhones do. It seems like it would, but only after months of use and dozens of apps will we see if the iPad loses its zip in its old age. But for now, as pretty much everyone who used one in January and reviewed one this week has noted, this thing is fast. Updated: The good people at Furbo did some serious benchmarks comparing the iPad and the iPhone, and their results confirmed what we found in our informal tests: the iPad's a speed demon. 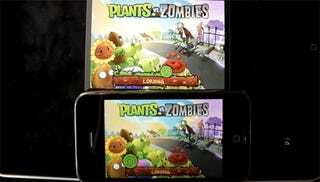 For native, Cocoa Touch apps, Furbo found that the iPad was about twice as fast as the iPhone 3GS, which is about what we saw when comparing load times for Plants vs. Zombies. On more intensive operations, the iPad ran almost 4x faster. Head to Furbo for the full tests, including one that pits the iPad with the original iPhone which really shows how far Apple's mobile devices have come. AnandTech has some tests comparing the iPad's A4 chip against the Nexus One's Snapdragon QSD8250, and they serve to further establish just how fast the iPad is. Web pages loaded 10% faster on the iPad than on Snapdragon, on average, and in some cases pageload times were up to 40% faster. The why is much more difficult to ascertain. It could be as simple as the the iPad OS being better optimized than Android, a definite possibility given how much longer Apple has been working on it compared to Google. The advantage could also be hardware. The A4 may boast higher IPC than Qualcomm's Snapdragon thanks to better core architecture, larger caches or a faster memory bus. The likely case is somewhere in between, where the iPad's advantage comes from a combination of hardware and software. For the full report, check out the post on AnandTech.